The security technology industry has seen $34B in total all time funding. Let’s examine the investors financing the security technology sector and identify the most active firms. 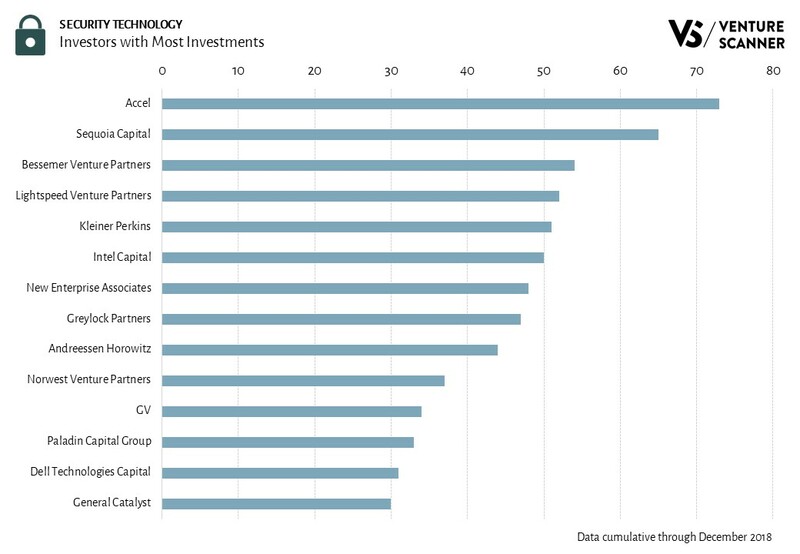 The graphic below highlights security technology investors based on the number of investments made in the sector. If an investor participates in two investment rounds in the same company (such as a Series A and Series B), that would qualify as two investments for this analysis. As the graphic demonstrates, Accel has made the most investments in the security technology sector with 73 investments. Sequoia Capital follows with 65 investments. Examples of companies that Accel has invested in include CrowdStrike, SimpliVity, and Netskope. Intel Capital and Dell Technologies Capital are notable Corporate Venture Capitalists (CVC) on the list. To learn more about our complete security technology dynamic report, visit us at www.venturescanner.com or contact us at info@venturescanner.com. Here is our Q4 2018 summary report on the security technology startup sector. The following report includes a sector overview and recent activity. The security technology sector has seen a lot of funding momentum in recent years. This blog post examines the different components of the security tech sector and how they make up this startup ecosystem. We will illustrate what the categories of innovation are and which categories have the most companies. We will also compare the categories in terms of their funding and maturity. Let’s start off by looking at the Sector Map. 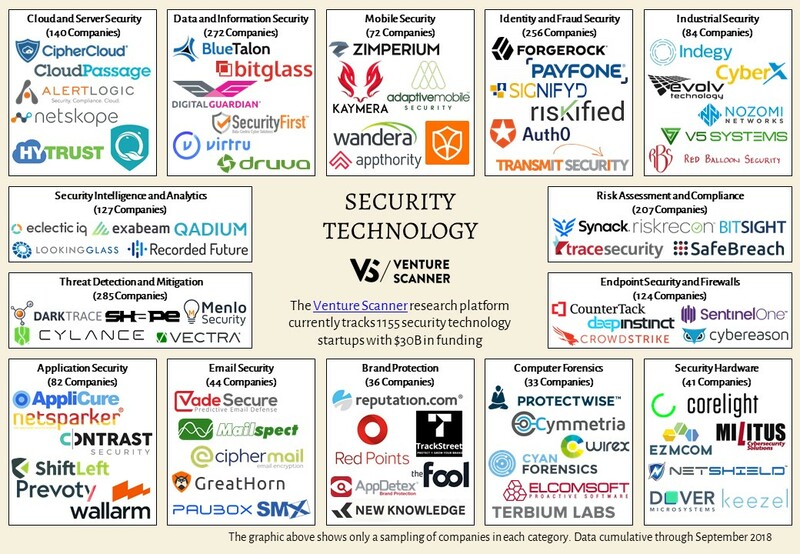 We have classified 1155 security technology startups into 14 categories that have raised $30 billion. The Sector Map highlights the number of companies in each category. It also shows a random sampling of companies in each category. We see that Threat Detection and Mitigation is the largest category with 285 companies. These companies monitor networks to detect and mitigate cyber attacks. Some example companies in this category include Darktrace, Cylance, Vectra, and Menlo Security. Let’s look at our Innovation Quadrant to find out the funding and maturity of these categories in relation to one another. Our Innovation Quadrant divides the security technology categories into four different quadrants. 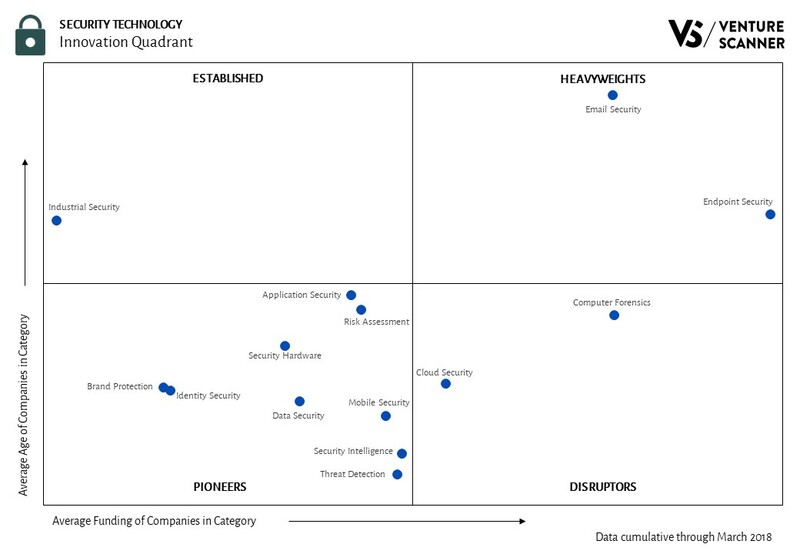 We see that the Pioneers quadrant has the most security technology categories with 7. These categories are in the earlier stages of funding and maturity. The Established quadrant has 3 categories that have reached maturity with less financing. The Heavyweights quadrant also contains 3 categories. These categories have reached maturity with significant financings. The Disruptors quadrant has Cloud Security as its one category, which has acquired significant financing at a young age. We’ve analyzed the security technology categories and their relative stages of innovation. Let’s now look at how they stack up against one another in terms of their total funding versus company counts. As the above graphic implies, the Threat Detection and Mitigation category leads in total funding with $10.5 billion. Its funding is almost 1.6 times the funding of the next category, Data Security with $6.6 billion. 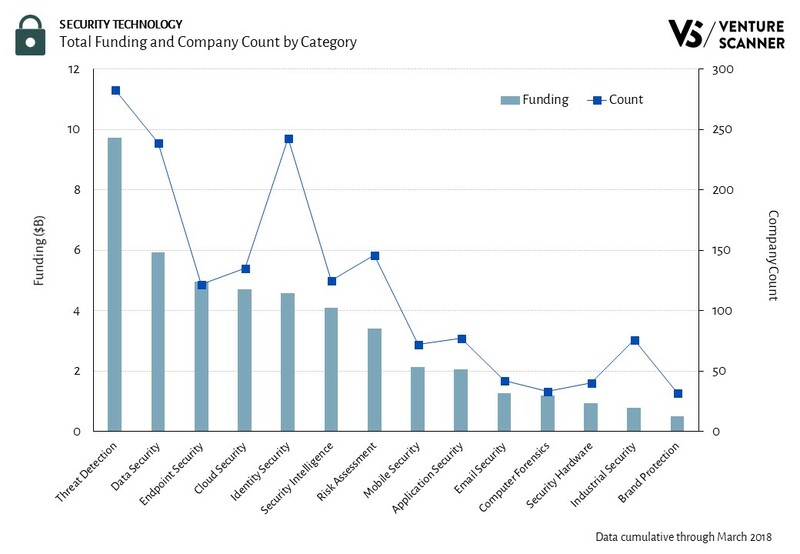 The analysis above highlights that the Threat Detection category currently leads the sector in both total companies and total funding as well. We’ll see if any other categories will catch up and take the lead during the rest of 2018. To learn more about our complete security technology report and research platform, visit us at www.venturescanner.com or contact us at info@venturescanner.com. 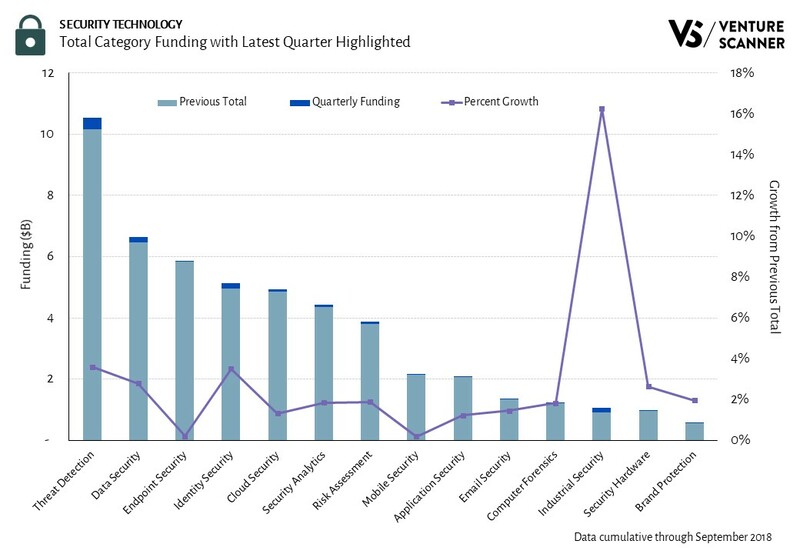 To start off, let’s review the amount of funding raised this quarter by each category within security technology. The above graphic highlights that the Threat Detection category leads the sector in Q3 funding with $360M. Its funding is more than twice the funding of the next category, Data Security at $180M. Threat Detection companies monitor networks to detect and mitigate cyber attacks. Some example companies in this category include Darktrace, Cylance, Vectra, and Menlo Security. 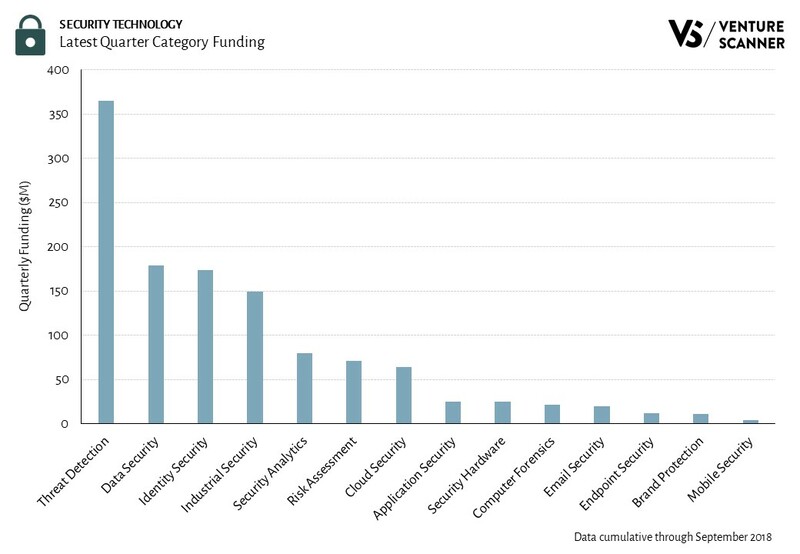 The graph below shows the all-time funding for different security technology categories. The Q3 funding and growth rates of these categories are also highlighted. 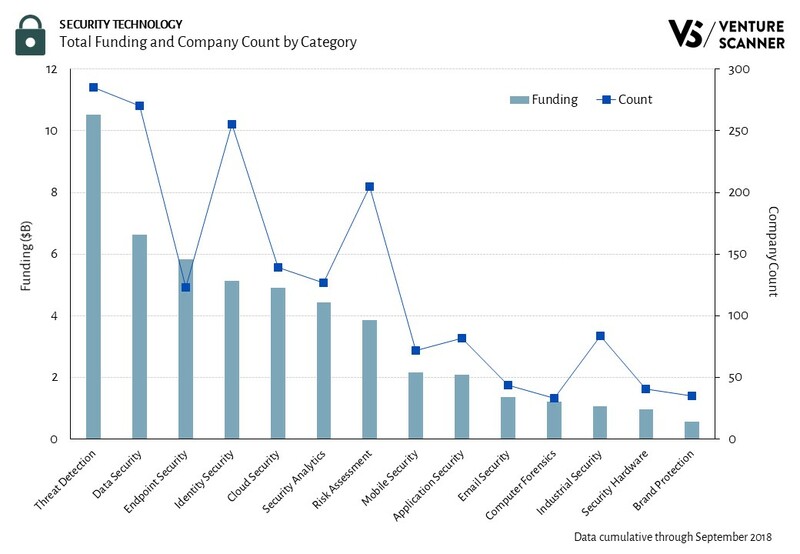 As the bar graph indicates, the Threat Detection category also leads security technology in total funding at almost $11B. This is approximately 1.6 times the funding of the next category, Data Security at almost $7B. In summary, the Threat Detection category is the clear funding leader both in Q3 and all-time. Let’s see how the the rest of 2018 shapes up for security technology! Here is our Q3 2018 summary report on the security technology startup sector. The following report includes a sector overview and recent activity. To learn more about our complete security technology report and research platform, visit us at www.venturescanner.com or contact info@venturescanner.com. Here is our Q1 2018 summary report on the security technology startup sector. The following report includes an overview, recent activity, and a category deep dive. Our security technology report and research platform contains companies that enable enterprises and consumers to secure their data and networks. They often focus on protecting information, authenticating identity, and defending against cybersecurity attacks. In this post we examine the different components of security technology and how they make up this startup ecosystem. We have classified the companies into 14 categories. This blog post will illustrate what these categories are and which categories have the most companies. We will also look at how these categories compare with one another in terms of their funding and maturity. Let’s start off by looking at the Sector Map for the security technology sector. As of March 2018, we have classified 1063 security technology startups into 14 categories that have raised $25 billion. The Sector Map highlights the number of companies in each category. It also shows a random sampling of companies in each category. We see that Threat Detection and Mitigation is the largest category with 283 companies. These companies actively monitor networks to detect attacks and mitigate them in real-time. Some example companies include DarkTrace, Cylance, Menlo Security, and Vectra. 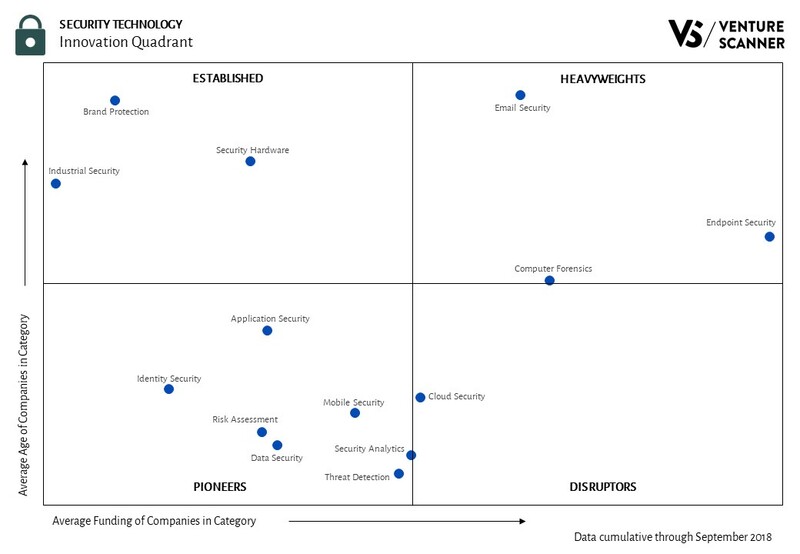 We see that the Pioneers quadrant has the most security technology categories with 9. The Pioneer categories are in the earlier stages of funding and maturity. The Disruptors quadrant contains two categories: Cloud Security and Computer Forensics. These two categories have acquired significant financings at a young age. The Established quadrant contains Industrial Security, which has reached maturity with less financing. The Heavyweights quadrant includes two categories: Endpoint Security and Email Security. These two categories have reached maturity with significant financing. We’ve now seen the security technology categories and their relative stages of innovation. How do these categories stack up against one another? Let’s look at the Total Funding and Company Count Graph. As noted earlier, the Threat Detection and Mitigation category leads security technology with 283 companies. In addition, the above graphic highlights that Threat Detection also leads in funding with almost $10 billion. Some of the best-funded companies in this category are FireEye ($841M), Tanium ($581M), and Alert Logic ($387M). It’s also noteworthy that the funding in Threat Detection is 60% higher than the funding in the next category, Data Security. From the above analysis, we can see that the Threat Detection and Mitigation category leads security technology in funding and company count. On the other hand, Endpoint Security and Email Security stand out as the Heavyweight categories in our Innovation Quadrant. They have reached maturity with significant average funding per company versus other categories. It’ll be interesting to see how the security technology landscape will change and develop throughout the rest of 2018.